Apparently, we are supposed to be impressed by her new level of enlightenment. 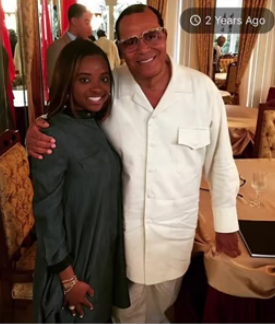 Mallory is one of many whose fixation on 'white people' dictates her statements and politics. But preoccupation with race has a history. According to the beginning of the program, the change in categorization of Jews from the "Hebrew" race to the "White" race was in part one of convenience, shoring up a "white" racial majority against immigrants. More importantly, the idea of categorization by race is itself a matter of convenience -- and manipulation. The concept of race was used to support colonialization and slavery in the 17th and 18th centuries and then the Enlightenment provided the rationalization to justify it. Eric Goldstein, author of the book "The Price of Whiteness: Jews, Race, and American Identity" gave further background on the issue of Jews and race in a lecture last year entitled "Jews and the Science of 'Race' in America"
In that lecture, Goldstein explains that Jews during the late 19th century and early 20th century wanted to preserve the possibility of Jewish assimilability, something that was far from being a given. 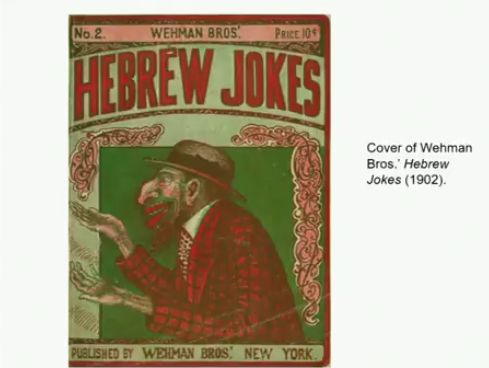 This is not some caricature from Der Sturmer -- it was published in New York in 1902 and illustrates the kind of images of Jews that circulated in popular culture in the US at the time. Jews were perceived as being different both physically and racially. They were hardly white supremacists. Ships passenger lists around that time used the European designation for Jews, where the nationality would be given as Russian, while the race was registered as Hebrew -- as opposed to the US designation that defined race along white/black lines. In 1909, the Commerce Department, which was in charge of the census at the time, suggested using the European system to better track and understand the new immigrants, a move that would promote Jews as being separate. The American Jewish Committee and Union of American Hebrew Congregations saw this as a liability and successfully lobbied against using the European designation. Also around that time, there were some courts that denied naturalization to Syrian immigrants, based on the understanding that they were not "white" -- which again caused concern among the Jewish committee because of the fear they could have the same problem. In his book, "Whiteness of a Different Color: European Immigrants and the Alchemy of Race," Matthew Frye Jacobson notes that Jews were not unique in being considered as non-white. 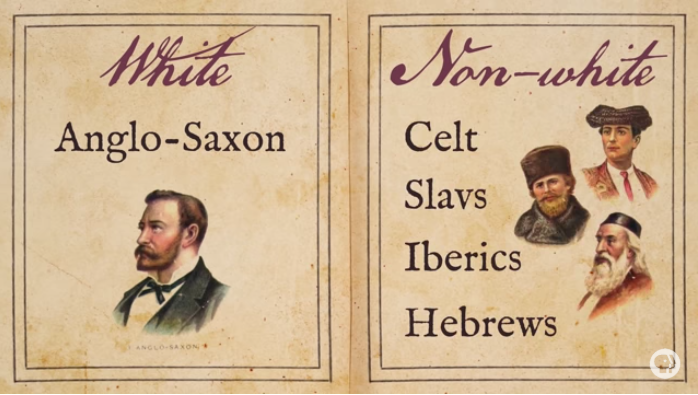 The Irish, Armenians, Italians, Poles, Syrians, Greeks, Sicilians, Finns and others were also not considered "white" and in fact only became considered white over time. As races are invented categories--designations coined for the sake of grouping and separating peoples along lines of presumed difference--Caucasians are made and not born. White privilege in various forms has been a constant in American political culture since colonial times, but whiteness itself has been subject to all kinds of contests and has gone through a series of historical vicissitudes. But while "whiteness" is a fiction, it is a very useful fiction. The concept of race is malleable and "whiteness" was used in the past by colonialists to enable and justify the subjugation of others. Today, there are those who share Mallory's obsession with race and manipulate the concept of "whiteness" to ostracize Jews.